If your WordPress website ever goes offline, you need to know immediately. An uptime monitoring tool will automatically alert you of any downtime so that you can take action straight away. I’m going to show you how to set up a free uptime monitoring tool called Uptime Robot. Do I need uptime monitoring? Most hosting companies claim to do their own uptime monitoring to make sure your website is always online. This is great, but I still recommend having your own uptime monitoring in place for any WordPress website. This is because hosting companies don’t detect ALL downtime. I’ve lost count of the number of times that I’ve been alerted that a website has gone offline without the hosting company knowing about it. True, this happened a lot more when we used a basic shared host. It hardly ever happens now we use a good quality managed WordPress host. However, it’s still better to be safe than sorry. While your hosting company is responsible for keeping the server online and running smoothly, it’s not their fault if something else goes wrong with your website. For example, the site might break after a software update. Or your domain name might expire. Your hosting company’s monitoring is unlikely to cover these non-hosting-related types of downtime. This means that you need your own uptime monitoring in place. Even if the hosting company is aware that your WordPress website is offline and is working on it, they may not have told you about it. It’s embarrassing for your boss or a client to tell you that a website is offline. As a result, you want to be the first to know about it. Uptime monitoring makes sure you’re the first to know. 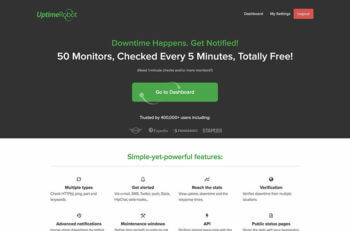 Uptime Robot is a free uptime monitoring service that lets you monitor whether your website is online. It will alert you by email or SMS text message if your website ever goes down. Uptime Robot is a standalone service and is not an uptime monitoring WordPress plugin. This is a good thing because it’s one less plugin to install on your website. It works with any WordPress website, and you don’t have to make any changes to your website. The free plan is very generous and lets you create 50 alerts. This is more than enough for any individual website owner, freelancer, or small WordPress agency. Next, I’ll show you how to use Uptime Robot to set up your own upcoming monitoring. Uptime Robot lets you choose to be alerted via email or SMS. Set up whichever methods work best for you. You can also choose how long your website should be offline before you are alerted. I usually choose 5-15 minutes, depending on how business critical the website is. Websites and servers often have minor blips with very short amounts of downtime, for example during a server restart or website software update. I only want to know about more significant downtime that I need to take action on. Choosing a longer period helps with this. This checks whether your website can be accessed at all at your domain. It will trigger an alert if your website is completely offline, for example if your server is down or your domain is not working. To use it, select the HTTP alert type. Enter the URL of the website that you wish to monitor the uptime for. Choose how you would like to be alerted, and the frequency. A keyword alert monitors whether a specific keyword or phrase is available on your homepage. (You can also use it on any other important page on your WordPress website). This is a clever way to check whether your website has stopped working for non-hosting-related reasons. For example, WordPress websites occasionally get stuck in maintenance mode after a software update. If this happens, the server will still be online, so no HTTP alert will be triggered. However, your website content won’t be showing, so this will trigger the keyword alert. Choose a keyword that will ALWAYS be used on your homepage (e.g. your company name or your main keyword). We use the keyword ‘web’ for the Barn2 Media homepage because it features several times on the page. If Uptime Monitor ever fails to find the word ‘web’ on our homepage, then something is definitely wrong! Create a keyword monitor for a keyword that will always be present on your homepage. Using Uptime Robot’s uptime monitoring, you can relax knowing that you’ll be informed if your website ever goes offline. It’s a great tool for keeping track of your WordPress website without having to check constantly. 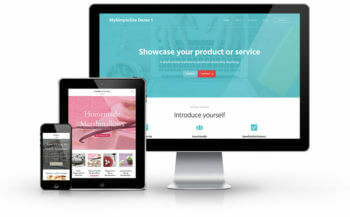 If you don’t want to build and maintain your own website, order a MySimpleSite today. Our affordable WordPress web design service comes with free uptime monitoring on every website. Your website could be live in just a couple of days! Nice post. However, I would recommend WebSitePulse as a monitoring service. Maybe the most customizable service out there in terms of price and service! Great post! On-page keyword monitoring is definitely a good way to keep track of your site's status. Check out https://www.pingmy.site/ as we also support HTTP Content and PING monitoring that would be useful to monitor any WordPress dynamic website.